1. Fixed distance – the knife is thrown rotationally from one of several fixed distances. Each distance corresponds to a particular amount of rotation, for example half-spin at 2 meters, one-spin at 3 meters, and so on. Generally speaking, this method is thought of as ‘traditional’ or ‘normal’ knife throwing. Let’s clarify some terms before we proceed. Rotational throwing refers to any technique in which the knife rotates end-over-end during its trajectory. The knife may be gripped by the handle or the blade. Half-spin is accomplished with a blade grip and approximately 180° of rotation. Full-spin (or 1-spin) is accomplished with a handle grip and approximately 360° of rotation. This concept is extended to include 1.5-spin, 2-spin, 2.5-spin, 3-spin, etc. No-spin throwing refers to any technique in which the knife does NOT rotate end-over-end during its trajectory. The knife is always gripped by the handle. Despite the name, some rotation is common – typically 10° to 100°. Other terms for this technique include quarter-spin, direct throw and spear-style throwing. No-spin throwing has roots in traditional Asian martial arts. No-spin throwing is always Instinctive. The two terms are often used interchangeably. Half-spin throwing can be Instinctive or Fixed-distance. Rotational throwing is almost always Fixed-distance – the two terms are often used interchangeably. However, rotational instinctive throwing is possible. There are four primary sub-techniques or styles of no-spin throwing. Although each style has a distinct origin, there is a great deal of compatibility between them – no-spin throwing is a freestyle art, and styles can be blended together freely, within reason. The following viewpoints are presented to provide a rough outline of general trends and to convey the multi-faceted nature of no-spin throwing. No-spin shuriken throwing is part of traditional Japanese martial arts. Generally, this method works best with smaller weapons, 5 to 8 inches in length. It is characterized by a downward arm motion and a sliding release. The sliding release – also known as a finger brush – counteracts the rotation of the weapon and facilitates the no-spin trajectory. This method typically employs a channel grip – the thumb holds the weapon in a channel formed by the first three fingers. Japanese shurikenjutsu is presently promoted by the Katori Shinto Ryu and the Meifu Shinkage Ryu. 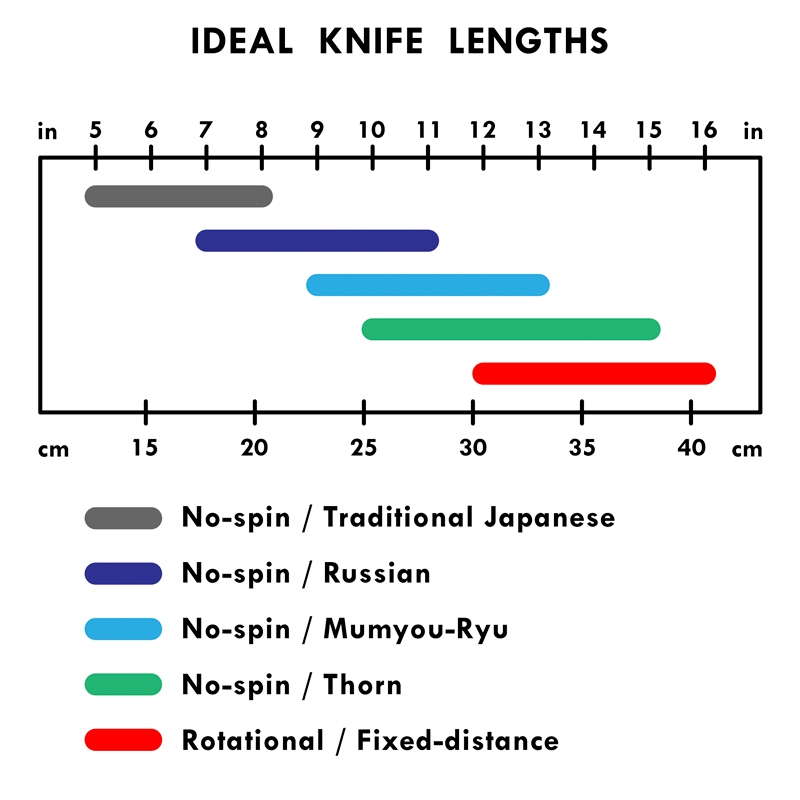 Nail Ahmadu and the late Yuri Fedin are the pioneers of Russian no-spin knife throwing. Generally, this method works best with medium sizes knives, 7 to 11 inches in length. It is characterized by a sliding release and a snappy whip-like arm motion – the arm is first drawn back, then abruptly pulled forward. This rapid reversal of direction makes Russian no-spin impractical for very long knives, but absolutely effective for medium sized knives. This method uses the drive-finger grip – the knife is held between the thumb and the curled middle finger, while the index finger rests on the knife spine. Our Arrow, North Wind, and East Wind knives are compatible with Russian-style throwing. Tom’s videos are an excellent resource for those interested in the Russian technique. This contemporary Japanese method was developed by the late Houzan Suzuki in the early 2000s. This method has accommodations for weapons of all shapes and sizes, but medium to long knives and spikes are ideal – 9 to 13 inches in length. It is characterized by a forward pushing motion and a crisp release. A modified drive-finger grip is used – the knife is held between the thumb and extended middle finger, while the index finger rests on the spine. The Mumyou-Ryu balance philosophy is illustrated below. Flying Steel is the authorized manufacturer of several Mumyou-Ryu products. The 11.8-inch Javelance is the best match for the Mumyou-Ryu method. This American style of no-spin ‘combat knife throwing‘ or ‘street knife throwing‘ was pioneered by Ralph Thorn in the late 1990s. Generally, this method works best with larger knives, 10 to 15 inches in length. It is characterized by a simple windmill-like arm motion, a sliding release, and a drive-finger grip. 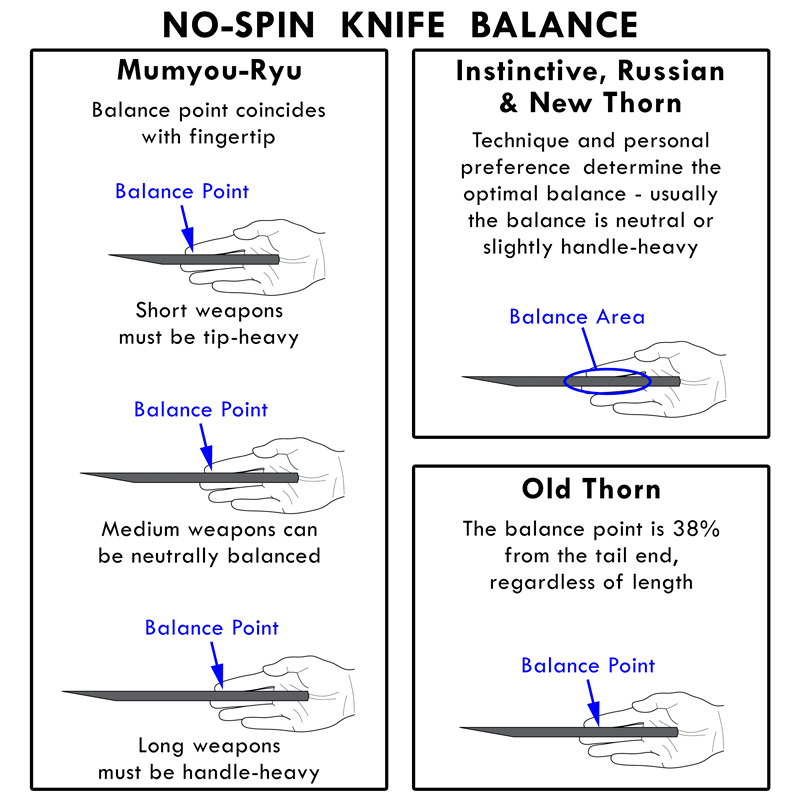 Initially, Thorn put a strong emphasis on a 38/62 knife balance philosophy, illustrated below. However, Thorn now encourages a focus on good technique rather than a particular knife balance. The Shur-Knife is Thorn’s ultimate no-spin knife design, conceived, prototyped, and refined after decades of experience. 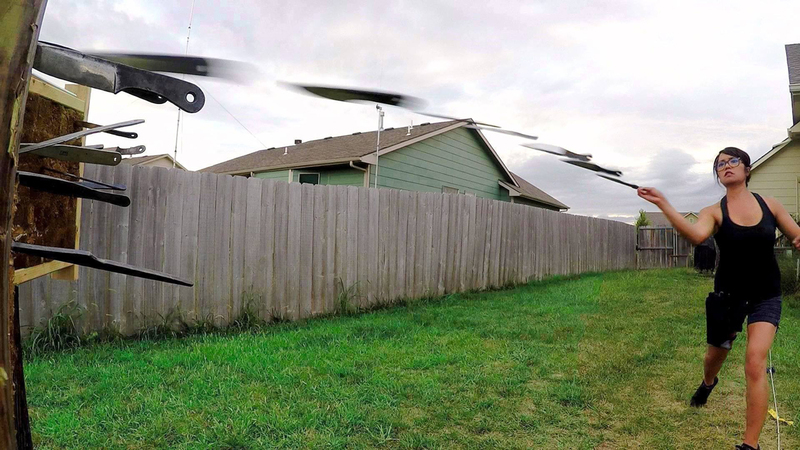 Flying Steel is the authorized manufacturer and co-designer. The vast majority of no-spin throwing knives are handle-heavy, which means the balance point is closer to the tail end than the tip. The ability to control and limit the rotation of the knife is the core skill of instinctive knife throwing, and most people find that a handle-heavy balance is best. When you are learning no-spin throwing, a knife with a very handle-heavy balance will generally make it easier to get the basics of the technique. However, as your ability to control the rotation of the knife improves, you may find that a more neutral balance is helpful. The Arrow knife is very handle-heavy. The North Wind and East Wind knives are also handle-heavy, but the balance point is closer to center of the knife. In the early years of the modern instinctive knife throwing movement (2008-2013), extremely handle-heavy knives, such as the Shur-knife and Flying Phi, were in fashion. The current popularity of the Arrow knife is a return to a previous well-established balance preference, not an innovation. There is a strong correlation between the various sub-styles of knife throwing and typical knife lengths. The basic trends are outlined below. At the time of filming, this video was an acceptable demonstration. Now, however, there are much better resources to learn from. The ability to control and limit the rotation of the knife is the core skill of instinctive knife throwing. As target range increases, controlling the rotation becomes more difficult. Thus it can be said that skill equals distance. 18 feet is expert-level no-spin throwing; it takes many people years to get to that point. Regardless of your skill, there will always be a limit to your effective range. Many people switch to half-spin throwing at their no-spin range limit. Developing your skill is a matter of extending range, improving accuracy, and decreasing effort. It is extremely important to understand that instinctive throwing is 99% technique – you are making the knife fly straight. The knife doesn’t do this for you. 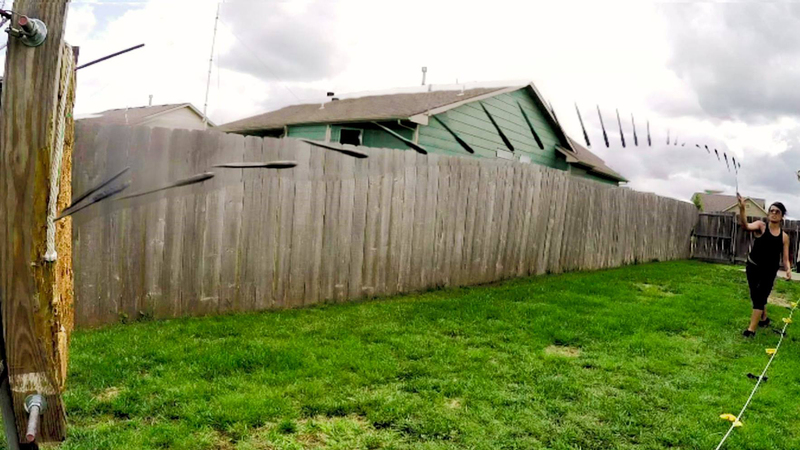 In your first practice session, after taking safety precautions under the supervision of a professional, you should attempt to throw from a close range – approximately 6 feet. Throwing from such a close range can be extremely dangerous, because you won’t have much reaction time to avoid a ricochet. Relax and use deliberate, fluid motions – no-spin is about finesse, not force. Do not try to add power to your throw at this stage – this causes over-rotation and increased risk of ricochets. If you are unsuccessful at 6 feet, move closer or throw at a target on the ground. No-spin throwing is more accurately described as quarter-spin throwing. This means you will release the knife when the tip is pointed upwards – the knife will naturally rotate during its trajectory. It is helpful to imagine the knife flying through the air and hitting the target in a vertical position – this is called under-rotation. Under-rotation is a good thing – it is a sign that you have control of the knife and are ready to extend your range and/or add power. Generally, the no-spin throw begins behind the head with the wrist tipped back, and the release occurs early – as your hand passes your ear. Stay loose and relaxed – use the full motion of your shoulder along with some hip rotation. No-spin looks very easy when it is done well, and it is normal to feel discouraged as you learn. If you are unsuccessful, consider filming some video of yourself and invite the online throwing community to offer guidance. No-spin throwing is a freestyle art, so expect to get different advice from different people. It is wise to pay special attention to advice given by those who can throw at 18 feet and beyond.